As my favourite LBD is looking a bit worse for wear these days after being thrown in a backpack and worn on pretty much every night out in Sydney for five months, I was on the lookout for a new staple piece for the party season. 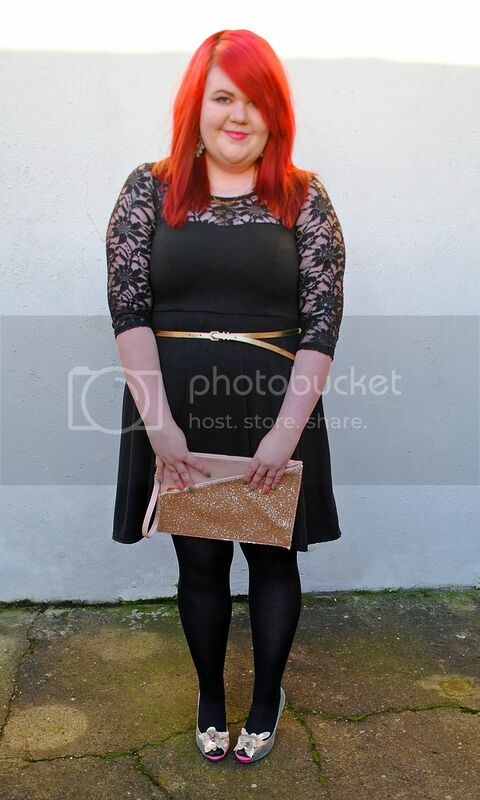 VoucherCodes were kind enough to send me some vouchers and I picked out this cute dress from the Pippa Dee concession in Dorothy Perkins (also available in Debenhams) with a pink and gold glitter clutch I've had my eye on for a while. I love that there is a an extra zip in the front to keep my phone! I was so tempted to get these peep-toe heels as well, as they're such a perfect match for the bag - however I decided to wear them with my Poetic Licence heels, which really don't get worn as much as they should! I used a 20% off code from VoucherCodes to get a further discount, which is no longer in use - however you can currently get 15% off using the code XMAS15 and free delivery with FREEDEL! 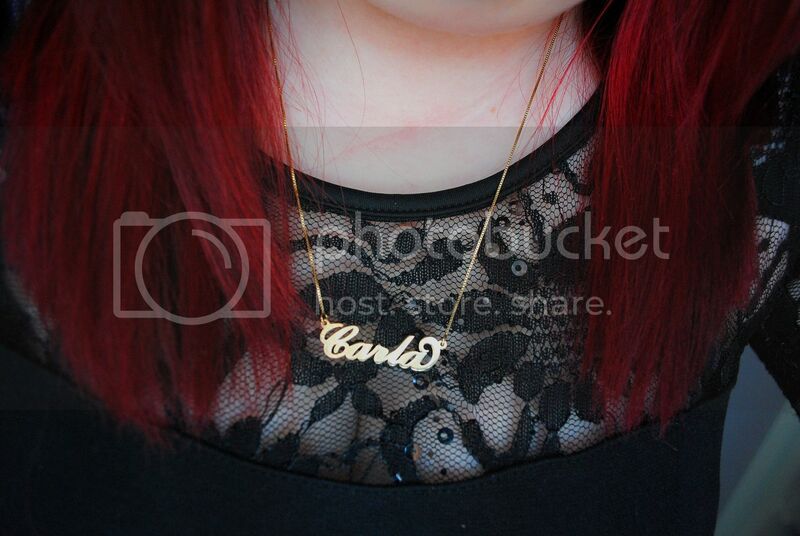 I love my new 'Carrie-style' name necklace from ONecklace! I think you could definitely dress this look up or down. It would look great with a blazer for some after work drinks, or grunged down a little with Dr Martens and a (p)leather jacket! I was planning on showing you guys some different looks - however I was feeling a little awkward as I haven't done an outfit post in so long. 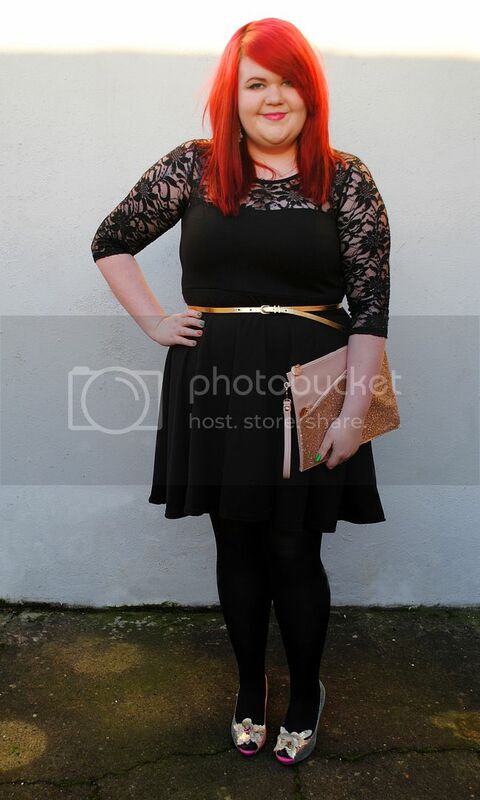 Also the weather was around 1*C and windy so I was absolutely freezing! 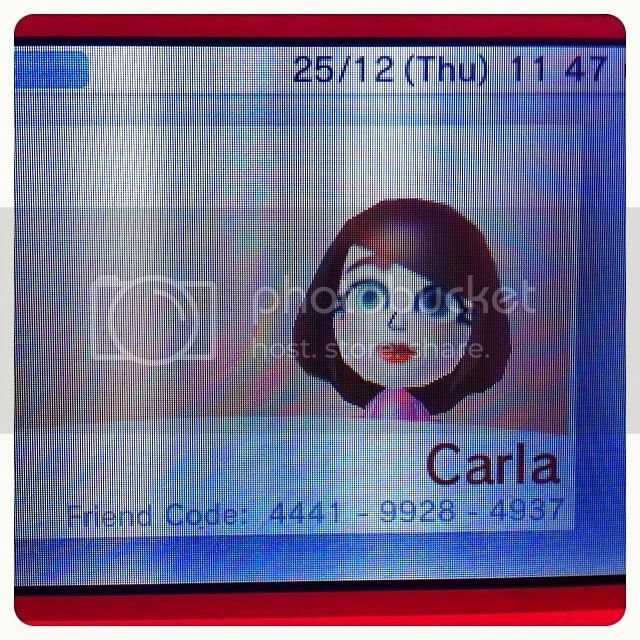 Also for any 3DS users, you are very welcome to add me as a friend. Please find my code below - tweet me with yours and I'll be sure to add you back! Anddddd I thinks that's me signing off until the new year. I'm not going to lie, 2013 has been a testy one. However onwards and upwards! I'll leave you with my favourite song from this year by Scottish synth pop band, CHVRCHES - I'm hopefully going to see them in March, eee! Favourite Holiday Films and TV! Sorry I've been away for the past month or so. I've been very busy with my new job - which I absolutely love - and spending time with family and friends this time of year. I even managed to squeeze in another trip to London where I hung out with Lauren, Daniel and Sam which was sooooo much fun. But I've missed you all. And since it's "Christmas Eve Eve" (in the words of the great Phoebe Buffay) I thought it'd be nice to put a post together about my favourite holiday specials and films I enjoy watching over the festive season. There's some you'd expect, and some you may not. Have a search around catchup services and services like Blinkbox and I'm sure you'll be able to find most of them! Beyonce is scheduled to put 'the star of hope' on a Christmas tree for underprivileged children, with presents, Santa and a Nativity. I don't usually like prank shows, but this will never not be funny. South Park always does Christmas well. There's always usually a twist on the usual jolly Christmas tale - and best of all, some musical numbers. 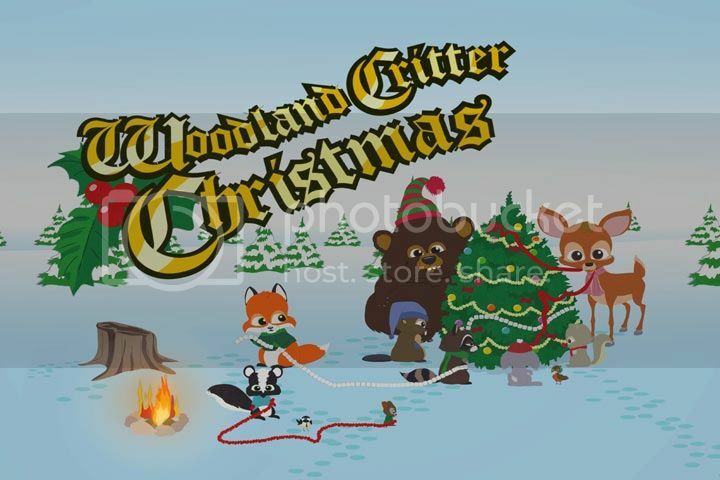 An earlier holiday episode Mr Hankey's Christmas Classics almost got the top spot - but I've only recently seen Woodland Critter Christmas, and honestly I think it might be one of my favourite episodes of South Park ever. I won't give too much away about the plot, as it's such a dark and hilarious send up of all the cheesy specials that we all know. 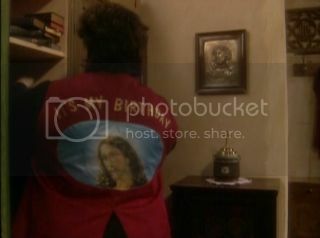 It isn't Christmas telly without something a bit sick, and it doesn't come sicker than the Bottom Christmas special. The party with their mates is soon interrupted when there is a knock on the door, but I won't spoil it. It's usually on BBC2 around this time of year, so keep an eye out for it. A group of Primary school children - all played by adults - prepare and perform the nativity for their Christmas play. Originally a play, you can sometimes see amateur productions popping up around the holidays. 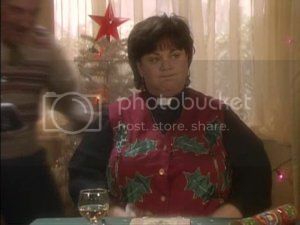 The Vicar of Dibley is one of my favourite sitcoms: set in the fictional village of Dibley, which is assigned it's first female vicar - the vicacious Gereldine Grainger who desribes herself as "a babe with a bob cut and a magnificent bosom". The story begins just two years after the change in The Church of England laws which permitted women to become ordained. It's really charming, harmless and entertaining - but my favourite episode happens to be a Christmas themed episode, running about 15 minutes longer than usual. Gereldine is invited to Christmas lunch by all of her parishiners who do not want her to be lonely. However because she is too kind to refuse anyone, she decides to go to all of them. There are so many versions of A Christmas Carol, but the ones most often shown on British television around this time of year are Mickey's Chistmas Carol (1989), A Christmas Carol (1999) with Patrick Stewart and my favourite: The Muppet Christmas Carol. Now I wasn't a bit Muppets fan growing on - truth be told I was a bit scared of them. But over the years it's really grown on me, and is now one of my firm favourites. The songs are great, and it's surprisingly touching. I'm howling by the time Tiny Tim sings Bless Us All. And if you don't link the Muppets, then it's worth a watch just for Michael Caine singing. Before Russell Brand went and became a Hollywood star he had a show here in the UK called Ponderland, which was essentially a series of monologues and taking the mickey out of old television and video footage. Each episode of themed, such as 'Childhood,' 'Crime,' 'Education' and 'Family' - but the one most people remember when prompted is the Christmas special, which was also sadly the last episode. In this one he makes fun of a un-rowsing pack of Christmas revellers, carolling yobs, and a department store Father Christmas ("Naughty Norbert Cleaverhook") who sounds more like a Dickensian villian. The Snowman is a British institution. It's usually shown on Christmas Eve, and I do try to watch it every year. It's our 'Frosty The Snowman' but being the UK the ending is marginally less jolly. I'm also including here the very under-rated Father Christmas. This must have been on one Christmas and my dad taped it for me because I can't recall seeing it on TV since. 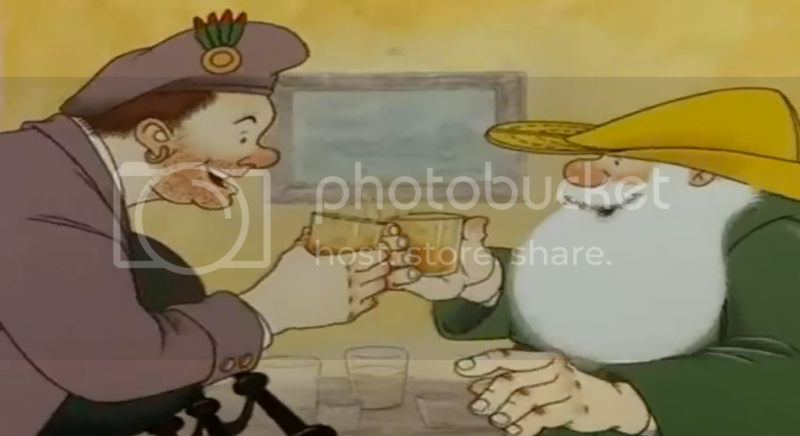 In a twist to the usual story of Father Christmas inhabited in the North Pole with a magical factory of hardworking elves, this animation revolves around Santa in a small house in England, and going on a much needed post-Christmas holiday. However he keeps getting spotted and having to move on. He's not so much the jolly Santa we all know. He's a bit grumpy, prone to swearing (well, "blooming") and is shown drinking heavily, hungover, gambling, dancing with chorus girls, over-indulging in fancy food and ending up with diarrhoea. Now as a kid, there was a nothing funnier than Santa with the runs, but I wonder if some found Santa's antics a bit much and that's why it is not shown as often as The Snowman. But try and get a copy if you can - it's way more charming than how I'm describing it. Ross wants to introduce his son Ben to Hanukah but is upset at the prospect of no Santa during the holidays. Ross goes to hire a Santa suit to appease him – however being so close to Christmas, he takes the only one left, and becomes ‘the Holiday Armadillo: your part-Jewish friend” to teach him all about the traditions and festivities. The Friends holiday episodes are all great (especially The One Where Rachel Quits and The One With The Routine) but this one is extra special as it’s a mainstream holiday show that doesn’t focus on Christmas. There are very few Christmas films that work all year around - this is one of them. Arnie plays a workaholic father who leaves it to the last minute to buy the most popular toy of the year - a Turbo Man - for his son. So therefore finds himself running on Christmas Eve around trying to find the last one in the city - competing with another panicked father, played by Simbad. It's absolutely hilarious, full of one liners, comments on the commercialisation of Christmas and of course has a nice sentimental ending. Are any of your favourites in this list - did I leave out something crucial? Right, that's me singing off again for the holidays. I hope you all have a wonderful time, and I'll be back later this week with a post on party-wear for New Year's!